Phoenix, Reilly Bond In Director Audiard's "The Sisters Brothers"
To play any brother, by blood or not, of John C. Reilly is an intimidating prospect given just how firmly entrenched Will Ferrell is as Reilly's on-screen sibling. "Step Brothers," their 2008 comedy classic that took the adolescent adult to absurdist extremes, looms large. It did even for Joaquin Phoenix in deciding to play Reilly's brother in "The Sisters Brothers," Jacques Audiard's Western. Phoenix considers "Step Brothers" one of his all-time favorites. "I knew from that movie. It's kind of unbelievable how brilliant he is in it," Phoenix says of Reilly. "I know people think of it as a broad comedy, but there's a lot of thought that went into that character." The two films, "The Sisters Brothers" and "Step Brothers," are worlds apart. But they are both centered on the subtle and combustible chemistry of brothers. And for Reilly, both Ferrell and Phoenix are two of the funniest people he's ever met. "Both," he says, "have made me pee my pants and fall down laughing." "The Sisters Brothers," the first English-language film for the French filmmaker Audiard ("A Prophet," ''Deheepan"), is based on Patrick deWitt's novel of the same name. Phoenix plays the hotheaded and hard-drinking Charlie Sisters, younger brother to the more level-headed and uncertain Eli (Reilly). But they are both feared hired guns, who are dispatched by their boss, the Commodore, to track down a chemist (Riz Ahmed) with a radical idea for gold detection. The movie, which Annapurna Pictures will open in limited release Friday, is largely a pair of two-handers — one between Phoenix and Reilly (together for the first time), the other between Ahmed and Jake Gyllenhaal (a reunion from "Nightcrawler"), who plays another pursuer who first locates the sought-after chemist. Both relationships throb with existential quandary and more immediate confrontations with change. Reilly's Eli, for example, encounters a tooth brush for the first time. And much of the delight in "The Sisters Brothers" is seeing two very different performers like Reilly and Phoenix interact and respond to each other. Phoenix, ruthlessly self-deprecating, is a powerfully instinctual actor who abhors nothing as much as over-analysis. The voluble, exacting Reilly is more prone to self-doubt and communal investigation. "It quickly became apparent to me when we started: I don't know this guy at all," Reilly said in an interview at the Toronto International Film Festival. "In fact, it's so intense to be around him, I don't know if I can even handle it. We couldn't even make eye contact at first." The project is a long-running one for Reilly, who acquired deWitt's manuscript and produced the film. He considers the six or seven years it took to make and release easily his longest job ever. 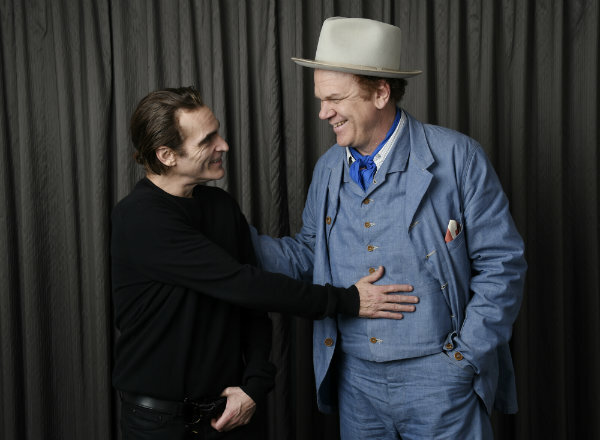 He and Phoenix first met through their mutual friend and director Paul Thomas Anderson but got to know each other making "The Sisters Brothers." "He came over to my place," says Phoenix. "Sometimes you just feel something about somebody. I remember when he left, I was talking to my girlfriend (Rooney Mara) and I was like: 'He's about to do some amazing work.' Just the way he talked about it." "That's how we found our way into each other. We'd just walk in Spain for hours and hours without talking," says Reilly. "It sounds really weird." "He's impossible not to adore and I did my best to make him dislike me," Phoenix says. "He was so committed and hard-working and detail-oriented, there was never a moment where he just showed up. Because there is always, no matter what you're doing, a couple days where you're like: '(Forget) this, when is lunch?' And he never did that." For Reilly, "The Sisters Brothers" is ultimately about transformation through human connection. He views it as an "unvarnished, un-mythologized" look at a West that was more diverse than has often been captured in films. The appeal for Phoenix was — similar to his crime thriller earlier this year with Lynne Ramsay, "You Were Never Really Here" — in deconstructing the genre. "Honestly, I don't think I've ever seen a good Western. I wouldn't even know what ... it was," Phoenix says. "But I didn't think about this as a Western and I told Jacques I didn't like Westerns. He and we were trying to find things that defy the expectations of what the genre is." But remaining, to a certain degree, unconscious about the larger themes is an essential part of Phoenix's approach to acting. "It's fun to think about," he says of the meanings behind "The Sisters Brothers." ''But half the time you think you come up with an answer or a reason why someone behaves the way they do, it's just not real. It's fun and you think you're being (expletive) clever. But the truth is the best (expletive) is when you're like: I don't really know why this is happening. If you think about this too much or talk this way when you're working, you start selling it." "It's like magic. It's really hard to be that unpredictable on camera, I can tell you from a life of performance," says Reilly. "The amount of thought and planning and rehearsing and setting things up, and then to be unpredictable after all of that? It's really, really hard." Reilly, though, has a series of films coming up that, like "The Sisters Brothers," are built around duos. In "Stan and Ollie," he and Steve Coogan play the iconic comedy team. In "Holmes and Watson" he reteams with Ferrell. "Even I who likes to think that I have a lot of variety in my career — and I do — you've got to look at this duo thing," says Reilly. "I thrive in those situations. I just never saw myself as the sole star of anything. I can do great things if I would in collaboration with people. I think even to be a good listener requires me to suspend my own ego and really stop thinking about what I'm going to say next and plug into you. Then a conversation happens. Then there's something's alive." "What can I say?" he adds. "I pick my partners well." Review: Director Jacques Audiard's "The Sisters Brothers"